Majestic Café is the most beautiful cafe in Porto. Actually, it’s on the Top 10 of the most beautiful cafes in the world. It dates back to 1921 under the name of Elite. It’s located on Santa Catarina Street, the main pedestrian walkway in the city. You can’t miss it. The façade is gorgeous but as you go inside your mouth opens and the sound “UAU” comes out! This cafe used to be the meeting point of the elite of the city. Writers, politicians, artists, thinkers. You name it. At the time, the elites met in different cafes around the city to exchange ideas and discuss different topics over a cup of coffee or a glass of absinthe. Time took its tole and the place was neglected. The glamour of “la belle époque” gave in to carelessness and Majestic Café was no longer majestic! 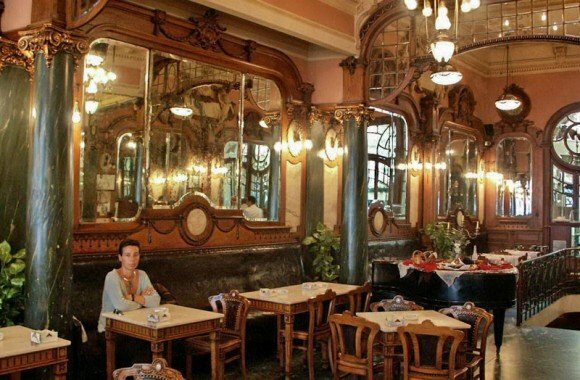 In 1994, the Majestic re-opened after two years of reconstruction work to bring back the glamour from the 20s and give the cafe back to Porto! 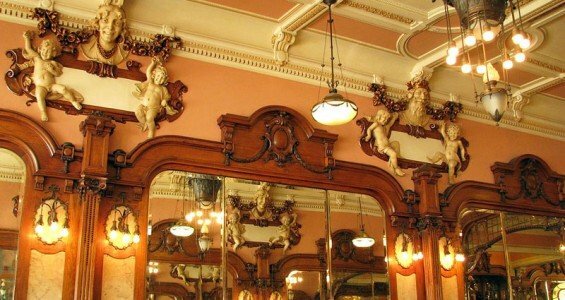 The beautiful walls and mirrors of Majestic. I must confess I fell in love with the cafe the first time i went there. I love writing and it does have that romantic atmosphere that I had only read about. Once you walk through the main doors it’s like you’re taken back in time and you can feel and hear the ideas, stories and conspiracies that took place at those tables. As expected in such places, the coffee is expensive. The menu is classy and it’s almost as if everybody feels obliged to behave in a certain way when at the Majestic Café. 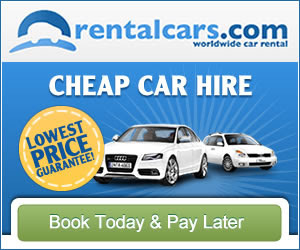 Don’t get me wrong: I do go there all year round, have a cup of coffee or tea and chit-chat with my friends. I don’t dress up. I’m pretty much myself. 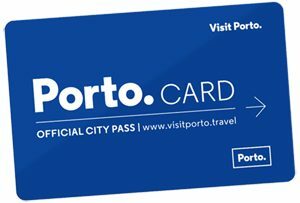 The thing is that there’s this aura that almost embodies the history and the story of the cafe and Porto itself. The cafe facade on a quiet night. There’s a small terrace on the back of the cafe where you can go and read a book while having a glass of port wine or just start writing your novel while having a cup of coffee and enjoying a piece of chocolate cake. It doesn’t matter what you’re having or what you’re doing. You’ll be overwhelmed by the beauty of Majestic Café. Enjoy it. 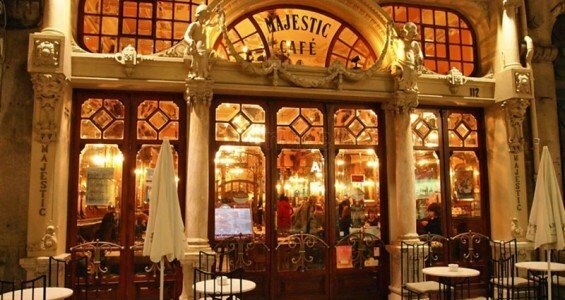 Majestic Café is located in a walking distance from São João Nacional Theatre, São Bento train station, Aliados Avenue or the City Library and is the heart of Porto’s main shopping street.